As indicated on the original label of this refreshingly pure viola, Carlo Antonio Testore (1687–c. 1765) was the eldest son (‘figlio maggiore’) of Carlo Giuseppe Testore, the patriarch of the Testore family of violin makers. The Testore family was active in Milan from the late 17th to the mid 18th centuries and probably found its original introduction to violin making through the Grancino workshop, where Carlo Giuseppe is believed to have apprenticed sometime around 1683. As with most other Italian schools of violin making in the late 17th and early 18th centuries, the Milanese school fell under the overwhelming influence of the Cremonese tradition, particularly that of the Amati workshop. 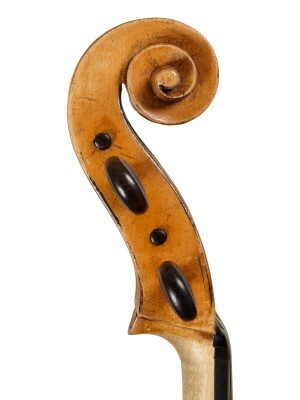 By the time that Carlo Antonio constructed this viola in 1752 he seems to have moved away from the influences and models he inherited from the Grancino tradition of his father in favor of his own model and style, which are reminiscent of a new set of Cremonese influences, Stradivari and Giuseppe Guarneri ‘del Gesù’ in particular. Carlo Antonio and his younger brother Paolo Antonio were both quite prolific makers and their output is often described as hurried and simplistic both in terms of workmanship and choice of materials. However, in studying and qualifying the Testore instruments one mustn’t ignore the economic and political circumstances in which these makers lived: Milanese violin makers weren’t nearly as renowned as their Cremonese counterparts, and the clientele they served was certainly less affluent and demanding. The quick and sometimes humble nature of the Testores’ work doesn’t necessarily indicate that they were inferior craftsmen, but rather that they were practical craftsmen who adapted to their circumstances with an output of suitable quality and refinement. This viola, by any expert’s count, belongs in the top grouping of instruments made by Carlo Antonio—not just in terms of its near flawless condition and preservation, but also in its execution and fine workmanship. Carlo Antonio took great care crafting this viola and he added some curious embellishments, namely the blackened chamfer of the scroll and the blackened rib miters. These are features that we don’t normally associate with this maker or for that matter with the Milanese school in general. However, these two features together are commonly seen on the violins of Guarneri ‘del Gesù’. Was Carlo Antonio adapting his production to be more Cremonese to satisfy his clientele? It is important to remember that obtaining a new Cremonese instrument in 1752 was no easy task: with the death of Carlo Bergonzi in 1747, the longtime juggernaut school of instrument production was in its darkest period of production in approximately 200 years. The model of this viola is loosely Stradivarian but the execution is reminiscent of late Guarneri. The darting notches on the soundholes are quite distinctive and were certainly intended to be a perfect V-shape, whether that detail was achieved in execution or not. The edgework and purfling are typical of Carlo Antonio’s methods: the back “purfling” is actually only scribe lines etched to the maple back and then filled with a black paste, whereas the purfling on the top is inlaid in the traditional way. The practice of scribing the back edges as a replacement to inlaid purfling is a common (but not exclusive) practice of the Testore family and it is not unusual to see Testore instruments that have been repurfled by later makers in an effort to ‘improve’ them. The general unpolished nature of the varnish of this instrument allows one to visualize what a mid-18th-century Milanese varnish would have originally looked like: what it may lack in richness of color and depth of body it makes up for in its unadulterated texture and patina.